Japanese language enrollment is up by 27.5 percent since 2006, making it the sixth most popular language studied on college campuses. Whether studying for school, business, or travel, Japanese For Dummies provides complete coverage of all Japanese language essentials including grammar, usage, and vocabulary. Complete with free conversational audio tracks online, this handy book offers everything you need to learn the Japanese language to get ahead in class or on a trip to Japan. In no time, you’ll make sense of the language well enough to communicate with native speakers! 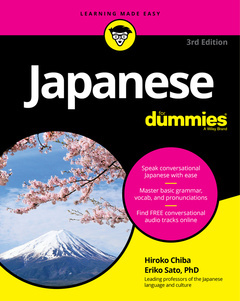 Whether for work, school, or fun, Japanese For Dummies is the fast and easy way to add this language to your skillset! Hiroko Chiba is professor of Japanese at DePauw University, where she teaches all levels of Japanese language and directs the Japanese language program. Eriko Sato, PhD, teaches Japanese at the State University of New York at Stony Brook. She authored the previous editions of Japanese For Dummies and Japanese Phrases For Dummies.